With a great balance between sweet, heat, and tang that's given add depth and complexity by way of mustard, this is a mighty fine sauce out of the jar. This started brewing in the family of Carl Lewis back in the 1950's. Carl's father was the original creator, while his mother tinkered with the recipe over the years to get it just right. Carl knew he had something good on his hands, but struck out trying to get the sauce on local supermarket shelves in North Carolina. He found a pathway to success via NASCAR's Dale Earnhardt, who was sent a bottle and loved it. Dale connected Carl with John Boy & Billy of The Big Show, a radio broadcast out of Charlotte. 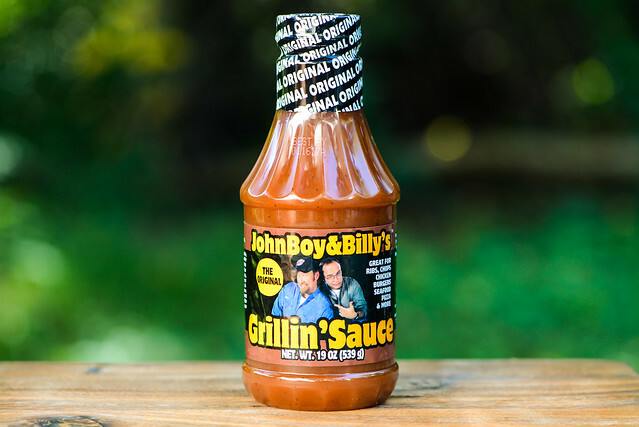 Carl became a regular on the show, known at Carl the Chef, and John Boy & Billy helped get the sauce off the ground and onto shelves back in 1996. Carl continued to work on his recipes and the brand today boasts four different sauces and three distinct rubs. A heavy hit of vinegar backed up by mustard is the dominating aroma of this sauce. The sharpness of these two primary components is lessened by a pretty strong sweetness that has tomato mixed in, giving the sauce a secondary ketchup-like smell. There's hints of onions and garlic that add depth to the sauce, and just the slightest touch of heat probably from powdered peppers. 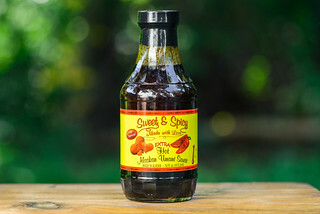 This smooth, glossy, rusty orange sauce sits just south of medium on the thickness scale. It's semi-transparent, which lets you clearly see black and red spice specs peppered throughout. 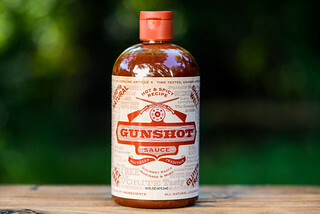 It has a syrupy consistancy, which leaves the sauce pouring in a quick and steady stream off of a suspended spoon. As the sauce slows, a few final drips release and a thin coating is left clinging to the silverware. In this coating, there are small bits of onion that weren't very discernible before, which add a little texture to the sauce. A corn-syrupy sweetness starts off the flavor. Tomato quickly mixes in, giving it a very ketchup-y tilt that was hinted at in the aroma. Mustard hits next, which adds a nice contrast to the fruity sweetness. Vinegar follows next, bringing a mellow tang to start. Right before that tartness intensifies, the bits of onion and garlic make their presence known, then are drowned out by the tang and a increasing heat. The final taste is mildly spicy well balanced with sweetness and heavy tartness. This sauce coated the chicken in a very thin, transparent layer. It baked down well over indirect heat, which allowed the sauce to build up nicely over multiple brushings. 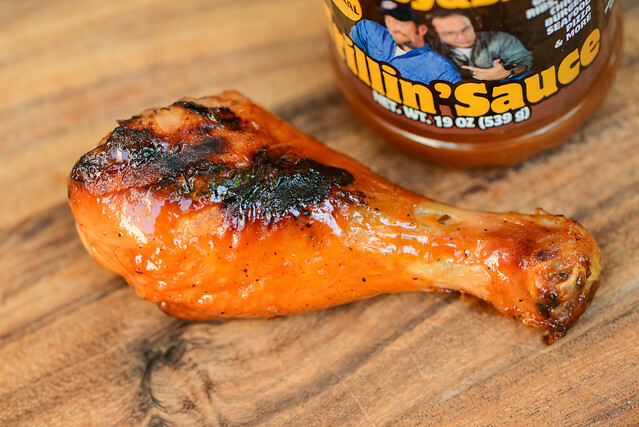 When moved to direct heat, the sauce started burning almost immediately, leaving a large swath of black char on the leg. The intense tang, mild heat, and contrasting mustard from out of the jar were almost non-present after being cooked. This left the leg tasting mostly like sticky, sugary syrup with a bit of tomato fruitiness. When I got to the blackened parts, they mostly tasted burnt, which is not always the case with all sauces. Out of the jar, this is a pretty nice sauce. 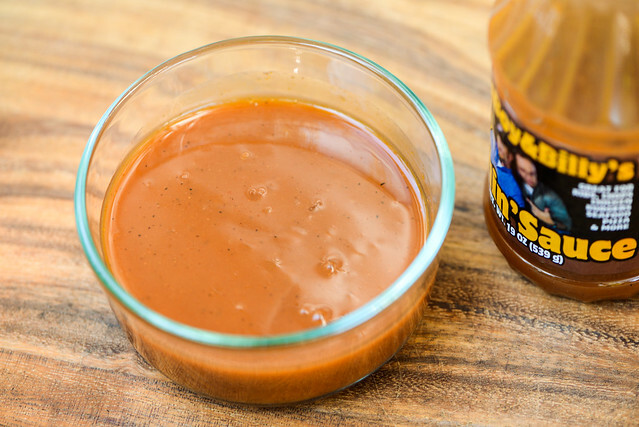 It had a pretty standard barbecue flavor, but the heightened presence of mustard takes it up a notch for me, adding a simple, yet very effective depth that can often be missing in standard tomato-based sauces. Unfortunately balance and complexity were lost after being cooked, leaving my chicken tasting a bit too sugary without the heat, tang, and bite that made the sauce work so well otherwise. 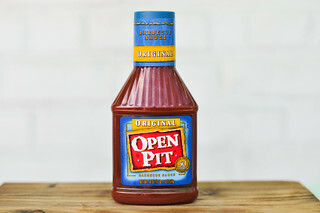 Because of this, I think the sauce makes a great condiment and would do fine dressing a pile of pork, slathered on a rack of ribs right before serving, or even as a dip for fries or other fried goodies. I'd steer clear of using it for high heat cooking though, where all the good can become diminished and the sauce quickly burns.